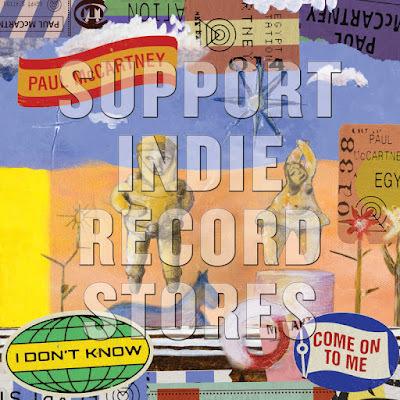 On Record Store Day in the US (Friday 23rd November), the single 'I Don't Know' b/w 'Come On To Me' will be made available on vinyl in a limited edition. The single will be limited to only 5000, and each copy will be a hand-numbered, one-time pressing double A Side release. That's going to be a collector's item, for sure !! Did anyone get this? My friend in Nashville got 569/5600 and wondered if anyone got a lower number. I just got 4611/5600 from a secondary seller for a great price (not exorbitant like on eBay) I think it was the only one he had though. Unlike the white label "Sweet Thrash" 12in mix of Hope for the Future RSD release from 2015, I don't think this release is all that scarce. I got a reasonably priced copy from eBay (UK) and one seller still has 10 copies available for £13.64. Curiously the UK copies don't seem to be numbered. Mine was less expensive. $15.99 (£13.64=$17.32) Can’t believe the pound is down to $1.27 today!! Strange though that yours are not numbered. 17€ in Germany - not numbered either. My store received about 10 copies. Not very limited really.